A well-planned flower border provides a colorful frame for a yard but keeping that border clear of invasive grasses takes vigilance and, often, an application of a well-chosen herbicide. 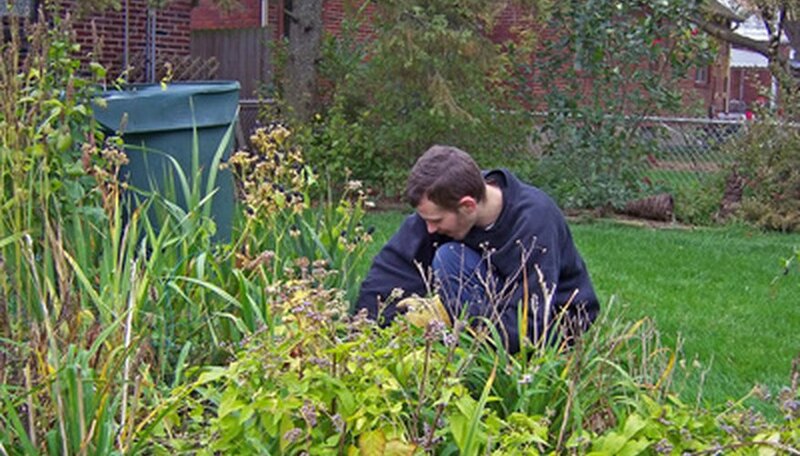 Most gardens can be cleared using selective methods but borders that have been overrun or require clearing may require “soil pasteurization” to kill grassy weeds. Once you discover what kind of grassy weeds you have in your garden, you can use the right method to kill them—and their offspring. Mulch beds with several inches of well-rotted compost, bark or wood chips. The thick mulch will insulate plant roots and cut down on grassy weed germination; weeds that do survive will be leggy and easy to pull. Dig out annual grasses by hand as soon as they appear. Crabgrass, barnyard grass, Johnson grass and yellow foxtail seeds are deposited in gardens by the wind, flooding or passing birds or animals. They will grow only one season but they will produce thousands of seeds. Root them out with a dandelion digger to kill next year’s crop. Use pre-emergent control on annual grasses including annual ryegrass. North Carolina State’s extension service recommends prodiamine and pendimethalin for pre-emergent control of annual grasses; trifluralin is one of the safest pre-emergents to use near ornamentals. Treat perennial creeping grasses like quackgrass, nimblewill and Timothy grass with post-emergent herbicide sprays containing glyphosate. Cover adjacent plants with shirt boards or cardboard to avoid overspray; spot treatments are often non-selective and will kill any plant. Spreading turf grasses like Bermuda grass will also succumb to glyphosate herbicides. Cultivate corn gluten meal into soil to control crabgrass germination and bentgrass. Research on at Iowa State University continues to find possible uses for this “natural” herbicide. Dig out a “moat” and fill it with 4 or more inches of mulch to make a “no grow zone” that is 6 to 10 inches wide around your flower bed. Any encroaching turf grass rhizomes will be weak and easy to pull. "Solarize” soil in borders that have been overtaken by grassy weeds. Cover the entire area with black plastic for six to eight weeks to force germination and then kill seedlings due to lack of sunlight. Fumigate old or overrun borders. Liquid metham sodium and granular dazomet kill everything in the soil; dazomet must be worked into the top 2 inches of soil. Water either fumigant in well, and cover the area with plastic sheeting for a week. Cultivate pasteurized beds to a depth of at least 6 inches. Remove dead seedlings, crowns and rhizomes with a garden rake before planting. Solarized beds can be replanted immediately but wait 14 to 20 days after cultivation for fumigants to dissipate before planting. Consult your local county extension service about types of weeds that grow in your area and the best way to kill them. Manage grass in flower borders by sensible prevention. Rototill gardens before planting and pull up all grass rhizomes and crowns. Cultivate gardens yearly and pick out perennial grass roots. Pay special attention to the areas bordering turf grasses. When fumigating, remove any plants you want to save before beginning and remove weeds from their roots. Fumigant chemicals are highly toxic; ask a professional to apply them if you lack experience with herbicides. Do not plant ornamental seeds where pre-emergent grass killers have been applied; start seeds elsewhere and transplant seedlings to avoid damage by the herbicide.